Speed past the finish line with the Kettler Barcelona Air Go Kart! This sleek black go kart with acid green detailing is sure to provide older children with hours of fun racing and cruising with friends. The Kettler Barcelona Air Go Kart, exclusive to Smyth’s Toys, is equipped with air tyres for high performance racing and high quality rubber treads that offer a firm grip on riding surfaces. The secure bucket seat is moulded to ensure a more comfortable ride. The seatback supports the rider for safer travel, whether you’re racing friends or go karting around the block. The distance between the bucket seat and the go kart pedals can be adjusted to suit the rider’s height and leg reach. This easy adjustment requires no tools, and allows older children to continue go karting in comfort as they grow. The handbrake is easy to reach and offers secure control of both rear wheels, while the freewheel option enables the driver to roll in comfort and style. 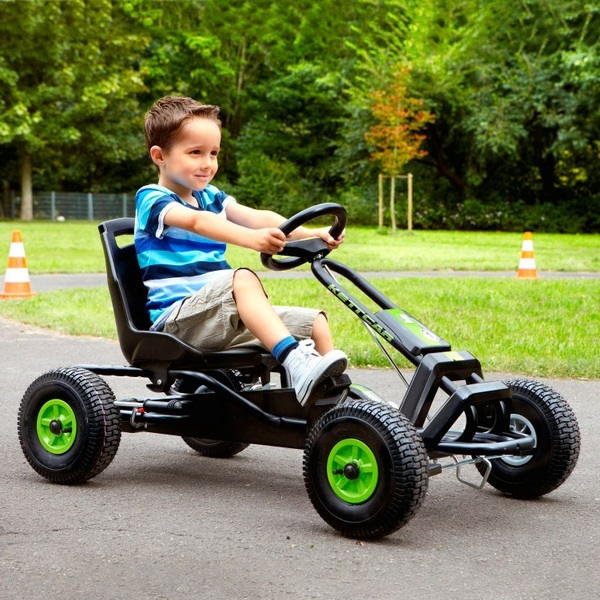 The German-engineered body of thisedgy go kart is streamlined and durable. The steel tube frame is coated in scratch- resistant polyester to keep this go kart looking sharp for longer. The dynamic Kettler Barcelona Air Go Kart is exclusive to Smyths Toys Superstores. EU Warning: Not suitable for children under 3 years of age. Protective equipment should be worn (knee, wrist, elbow pads and helmet) Adult supervision recommended. Not intended for use around parked or moving cars.